The Comedy of Errors is one of Shakespeare’s earliest and silliest plays. Slapstick and mistaken identities rule the day, as the Bard seems to just be starting to find his voice. There are flashes of his startling imagery entwined within the convoluted plot line and tortured puns. Seattle Shakespeare goes all out for the laughs here, filling their new venue at Seattle Repertory Theatre’s Leo K. Theatre with a robust energy. Egeon, a merchant from Syracuse in serious trouble in the city of Ephesus, presents the overly long opening exposition. Even the talented Todd Jefferson Moore, taking on this role, can’t quite save these early speeches from leaning toward tedium. Festivities kick into gear when we meet two sets of name-sharing twins: two brothers named Antipholus and their servants, two brothers named Dromio. Ensuing scenes are filled with slamming doors, bops on the head and manic acrobatics. The plot line lumbers along but never takes itself so seriously that it can’t stop for a goofy slapstick bit based on mistaken identities. The two Dromios, Kevin Kelly and Arjus Pande, are the most fun to watch, cavorting through their scenes. They both are physically put together like life-sized Gumbys. Director June Nichols has placed a batch of fun big-toys for the players: dangling ropes, a two-wheeled bike, a slide and a goofy clock with a long metal pendulum that never seems to have the right time. The cast does everything and anything with these props short of slapping ketchup on them and eating them. Act two runs into some pacing problems with a few bits going on too long; but Jay Myers, as Antipholous of Syracuse comes up with an uproarious scene as he prepares for a crucial sword fight. Indeed Nichols’ crew is so high energy and eager to please, we are willing to forgive them their brief moments of over indulgence. The audience is served everything but the kitchen sink and it is all in very good fun. The play seems to be set in early 1960’s Greece. Set designer Craig Wollam and costume designer Pete Rush fill their rolls with aplomb, providing a pleasing feast for the eyes. 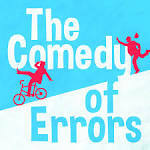 Seattle Shakespeare, celebrating its 25th season presents The Comedy of Errors through October 11. They are using the Seattle Repertory Theatre’s Leo K. Theatre in the Seattle Center for this show. For ticket information go to www.seattleshakespeare.org or call 206-733-8222.